Don’t have any iPhone or iPod speakers handy, but really want to boost the volume of the music or audio coming from your iOS device? 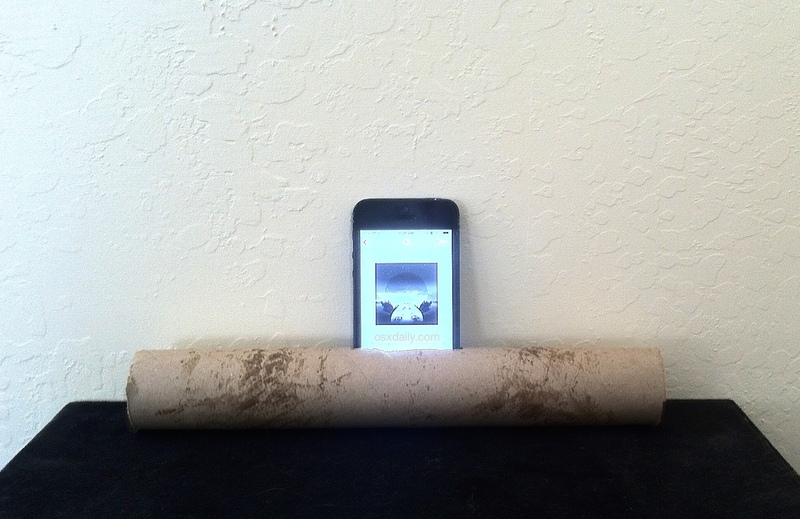 If you have a paper towel roll and two plastic cups, you’re good to go with this goofy and sort of effective DIY iPhone speaker solution. Guess what? It works, at least to amplify the sound. Does it sound any better? Well, no, not really, but it definitely sounds louder, and if louder is your intention then cutting a little hole into a paper towel roll and jamming your iPhone into it while blasting some music or a podcast will serve the purpose to amplify the audio with very little effort. Maybe adjusting some settings and the music EQ would make it sound better, but really if you want some decent iPhone speakers, just buy some or use an AUX cable to connect them to an existing setup. For some comparison with other Do-It-Yourself iPhone speakers and amplifiers, I think the sound quality of sticking an iPhone into an empty glass or large bowl is a bit better, but that’s not exactly a scientific conclusion. Of course the other perk with stuffing your iPhone into an empty cup is the claim of boosting cellular reception too, but we tested that and it didn’t work too well either. But, if you’re in a pinch and need to amplify your iPhone or iPod music (iPad too if you can use a wrapping paper roll I suppose), grab whatever is handy, whether it’s a roll or a bowl, and have a go at it. Good times. This is obviously funny looking, but I’ve done something similar with a cardboard box before when packing up a big empty room. Also, a big glass bowl really boosts the volume but sounds tinny. Best of all, get a bluetooth portable speaker set. If you do not have your cup speaker with you, you can also simply lay the iPod or iPhone on a table or shelf and place a book or anything flat on top of it, making sure that the book extends several inches beyond the end of the iPhone where the speaker is. 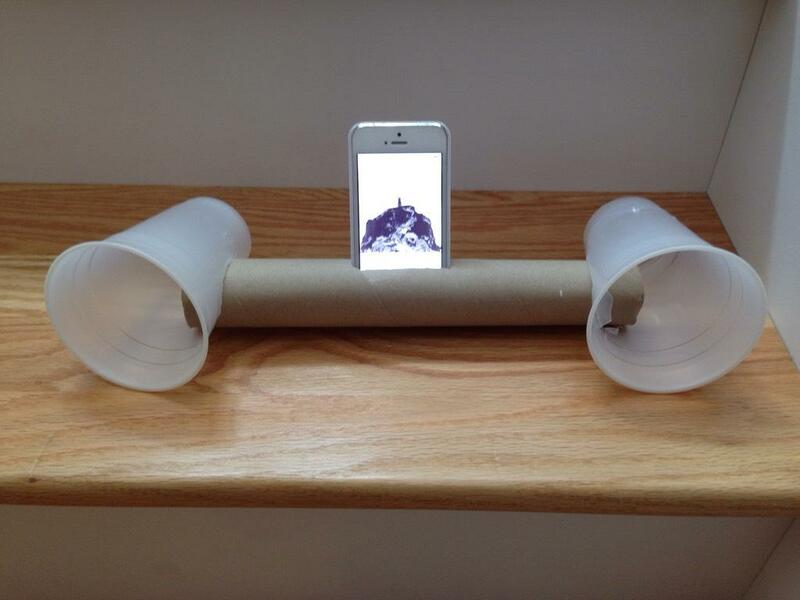 This creates a crude but functional horn.The ideal horn has a logarithmic taper so it is also good to make a heavy paper or cardboard cone that the speaker fits at the small end with the opening at that end matching the size of the iPhone speaker. Longer and bigger horns amplify further into the mid range. This can work well enough to use in a classroom. That’s pretty awesome, I’ll have to try that out! For that 80’s boombox effect, get a 55 gallon drum and cut a 10″ hole about a third of the way up from the bottom. Use duct tape to hold the phone in the hole you cut into the lid. It is ’80s, not 80′s. Too many people use apostrophe’s when they pluralize word’s. Apostrophe’s are used to take the place’s of omitted character’s. Instead of writing 1980s, one can write’80s. The time’s that I have used apostrophe’s in the previous paragraph, and this sentence, have been meant to illustrate how silly it looks to use apostrophe’s when pluralizing word’s. Beats, Bose, and iHome are in so much trouble!